…but what about the longest non-stop flights in the world? Airplane manufacturers are always pushing the envelope trying to design planes that fly faster, farther and more efficiently. So far, the plane that has held the record is an Airbus A340-500 with a range of 9,000 nautical miles (10,357 miles) but it’s interesting to see that Boeing largely dominates the ultra long-haul list. On Sunday, Boeing announced the launch of the 777X with orders for 259 airplanes including 34 for Lufthansa, 25 for Etihad Airways, 50 for Qatar Airways, and 150 for Emirates. The orders cover two members of the 777X family. The 777-9X will seat over 400 passengers and have a range of more than 8,200 nm. The 777-8X will be similar in size to the current 777-300ER and to the Airbus A350-1000, seating 350 passengers with a range of more than 9,300 nm. Today’s Featured Map illustrates the range of the 777-9X and 777-8X from Dubai, the hub airport for Emirates. Only a portion of the South Pacific is beyond the range of the 777-8X. 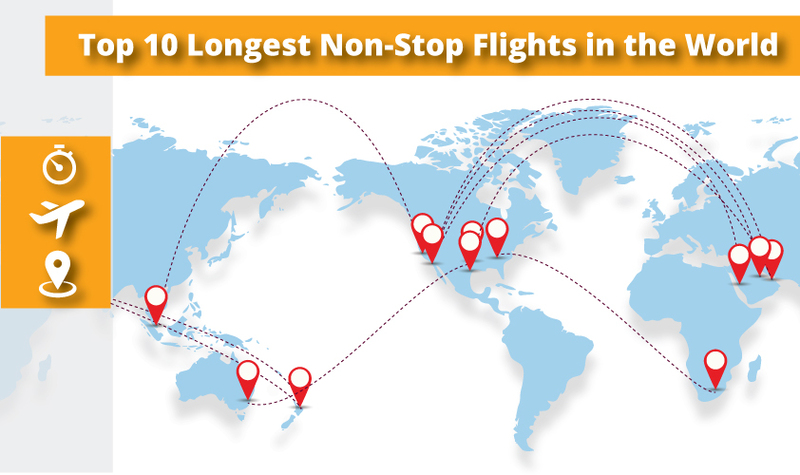 So, what are the top 10 longest (by distance) non-stop flights in the world? 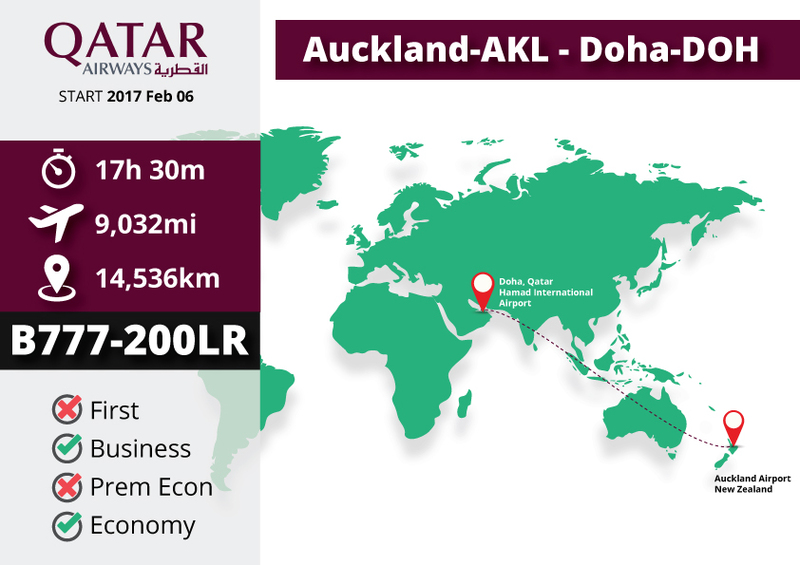 1- Auckland, New Zealand-AKL <–> Doha, Qatar-DOH is the newest flight on the list, having just begun on Feb 6, 2017. The flight will have you seated for a mind and bun-numbing (or comfortable, top notch experience in Business–sorry, no First Class offered on this route) 17 hrs 30 mins on Qatar’s Boeing 777-200LR/F. The flight (QR 921 / QTR921 – click to track) covers 9,032 miles (14,536 km). Cabins offered: Business (9.1) & Economy (8.2). 2- Auckland, New Zealand-AKL <–> Dubai, UAE-DXB is certainly the longest Airbus A380 flight in the world, clocking in at 8,824 miles (14,201 km). The flight is scheduled to take 17 hrs 25 mins so, if you have to take this flight, just make sure it’s in the lap of luxury in one of the 14 closed suites that Emirates offers on the A380. You can track the flight here: EK 449 / UAE449. This flight began on March 2, 2016. Cabins offered: First (9.9), Business (9.9) & Economy (8.9). 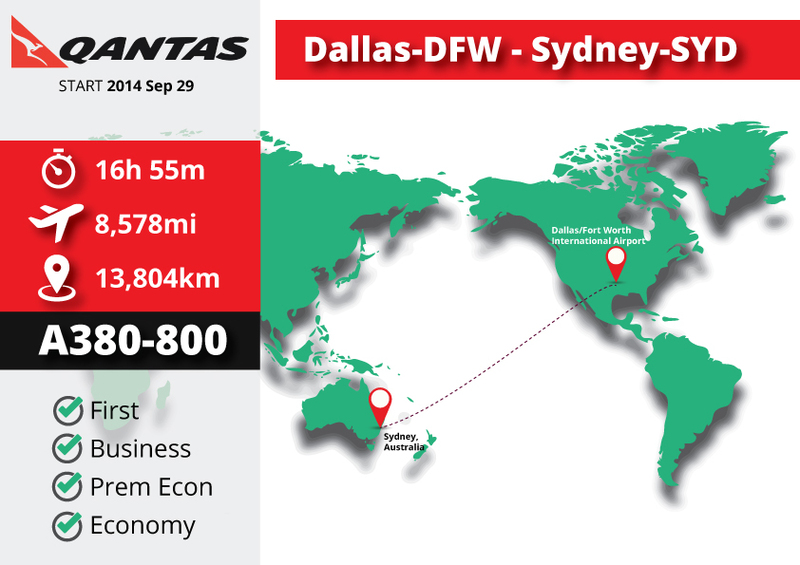 3- Dallas-DFW <–> Sydney-SYD, once the leader of the list, now comes in 3rd place at 8,578 miles (13,804 km). As of Sep 29, 2014, Qantas switched from flying this route on a Boeing 747 to a new Airbus A380. Unlike the B747, the new A380 aircraft prevents QF 8 (QFA8 – click to track) from having to make a stop in Brisbane-BNE on the westbound flight so the flying time is now 16 hrs 55 mins. The A380 now carries up to a whopping 484 passengers in 4 classes of service. Before switching to an A380, the route began in May 2011 using a Qantas 747-400ER (more details on this specialized aircraft here) at a scheduled time of 15 hr 25 min. With the B747, only the eastbound SYD-DFW flight was non-stop. The distance was such a stretch that the B747 had to make a stop in Brisbane on the westbound flight (DFW-BNE-SYD) see #4 below. This made the overall trip appx 19.5 hrs. Cabins offered: First (9.6), Business (9.3), Premium Economy (9.0) & Economy (8.5). 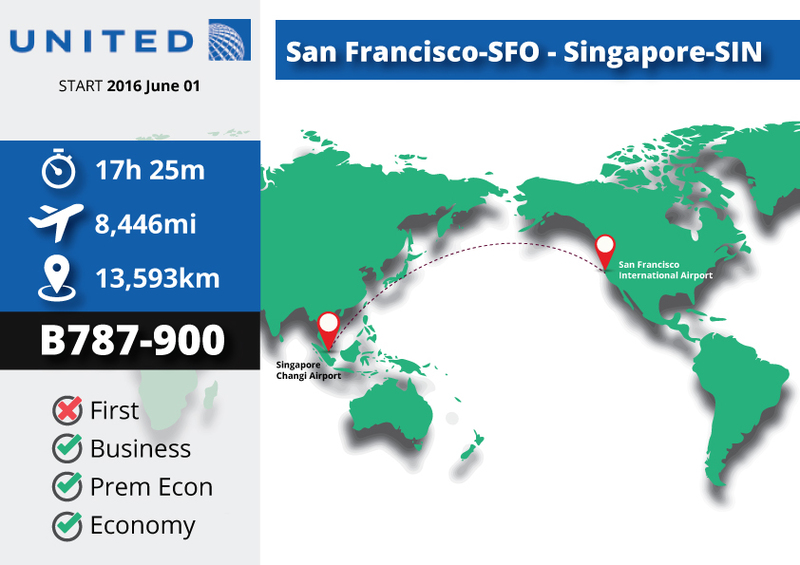 4- San Francisco-SFO <–> Singapore-SIN, is a rather recent addition having just been started by United on June 1, 2016. United flight # UA 1 / UAL1 (click to track) is operated by a Boeing 787-9 aircraft and takes a full 17 hrs 25 mins to cover the 8,446 miles (13,593 km). Not wanting to be left out, Singapore Airlines started service shortly after United on October 23, 2016, and use one of their 10 (of 14 total ordered) new Airbus A350-900 on the route. UA Cabins offered: Business (9.5), Premium Economy (9.1) & Economy (8.8). SQ Cabins offered: Business (9.8), Premium Economy (8.9) & Economy (8.8). 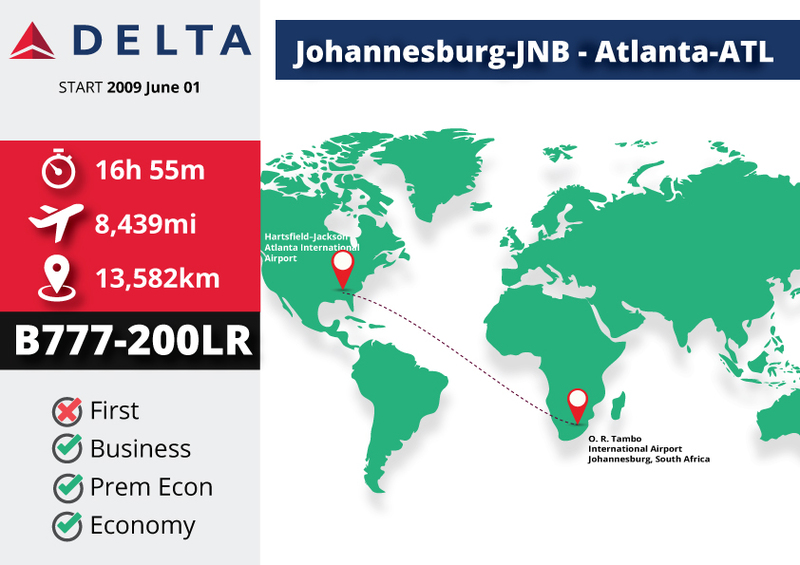 5- Johannesburg-JNB <–> Atlanta-ATL comes in at 8,439 miles (13,582 km) and is operated by Delta’s Boeing 777-200LR, taking 16 hr 55 min. Cabins offered: Business (9.7), Premium Economy (8.7) & Economy (8.4). Note: it’s quite interesting that the next 4 flights on the list are all flights operated by Persian Gulf carriers (Etihad, Emirates, Qatar and Saudia) to Los Angeles-LAX. And all 4 flights are within 84 miles of each other! 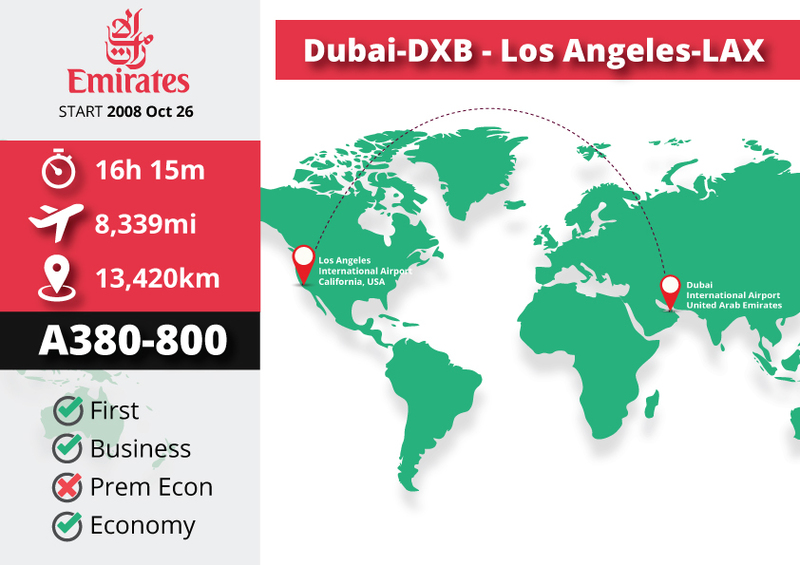 6- Abu Dhabi-AUH <–> Los Angeles-LAX takes number 6 with a scheduled flying time of 16 hr 45 mins. Etihad Flight # EY 171 (ETD171 – click to track) covers 8,390 miles (13,502 km) aboard a Boeing 777-200LR/F. 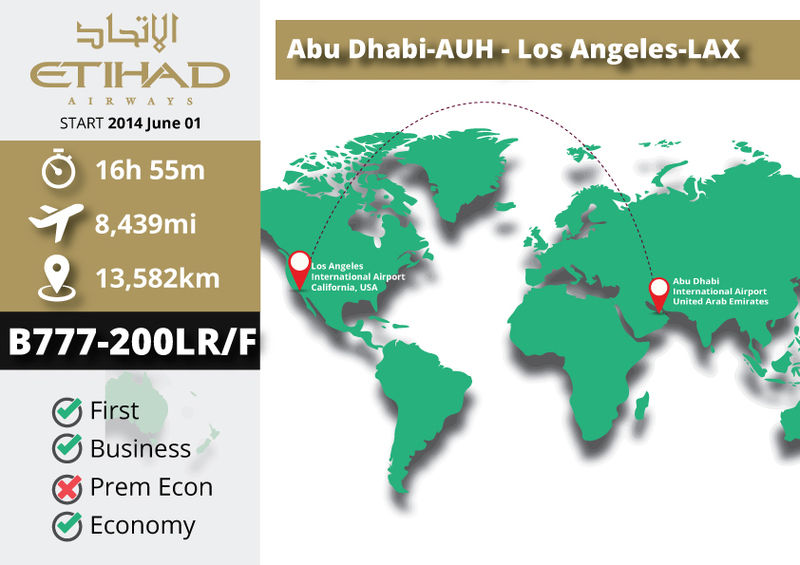 When this flight began on June 1, 2014, Los Angeles became the 4th U.S. city served by Etihad. Cabins offered: First (9.8), Business (9.7) & Economy (8.2). A380 Cabins offered: First (9.9), Business (9.9) & Economy (8.9). B777 Cabins offered: First (9.8), Business (9.1) & Economy (8.4). 8- Jeddah-JED <–> Los Angeles-LAX started service on March 31, 2014, and, just 7 miles shorter than Dubai-Los Angeles, is currently the 8th longest flight (it started off as 4th but has since moved down the list) in the world. The 8,332 mile (13,409 km) flight takes 16 hr 40 mins aboard Saudia’s Boeing 777-300ER, track flight SV 41 / SVA 41 here. Cabins offered: First (9.8), Business (9.7) & Economy (8.6). 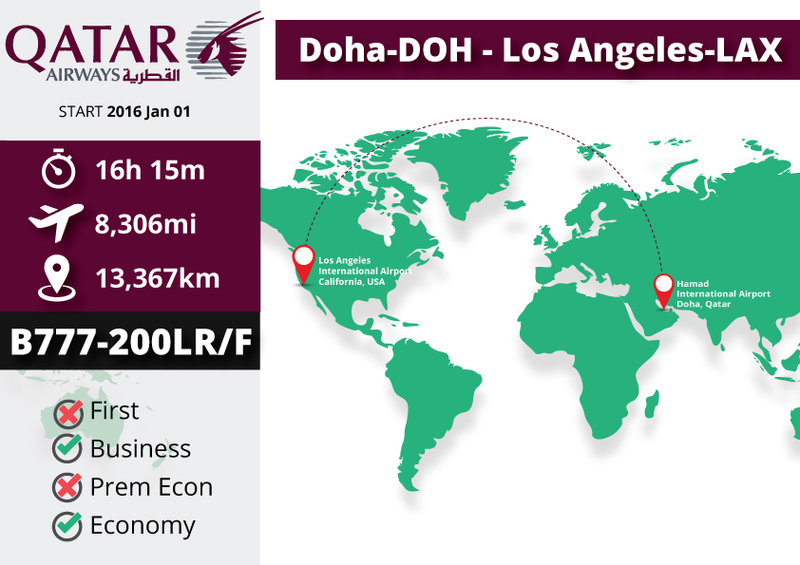 9- Doha-DOH <–> Los Angeles-LAX is flown by Qatar Airways using Boeing 777-200LR/F equipment. Flight # QR 739 / QTR739 (click to track) clocks in at 16 hr 15 min, covering 8,306 miles (13,367 km). This route was announced back in May 2015 and went into service on Jan 1, 2016. 10- Dubai-DXB <–> Houston-IAH takes 16 hr 45 mins on Emirates’ Boeing 777-300ER and covers a distance of 8,168 miles (13,144 km). Track flight # EK 211 / UAE211 here. Cabins offered: First (9.8), Business (9.1) & Economy (8.4). 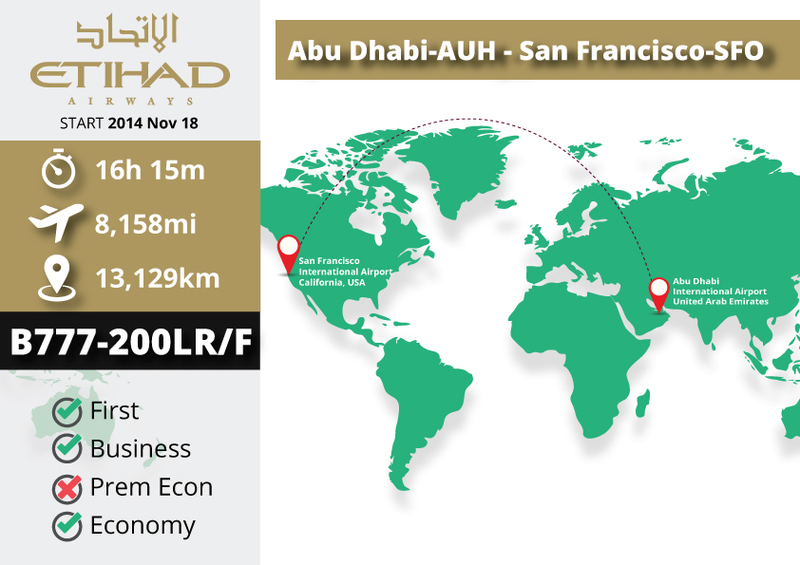 11- Abu Dhabi-AUH <–> San Francisco-SFO is another recent addition by Etihad Airways, having flown its first flight on November 18, 2014. This made it the 6th US city served by Etihad. The 8,158 mile (13,129 km) journey takes a scheduled 16 hr 15 mins to complete. Flight number EY 183 (ETD183–click to track) is flown on a Boeing 777-200LR/F. 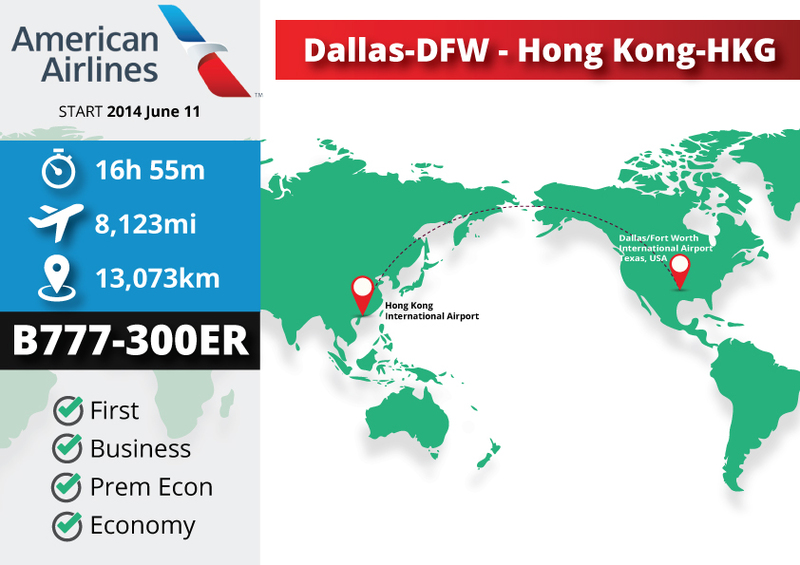 12- Dallas-DFW <–> Hong Kong-HKG is one of the only recent additions to the list by a U.S. based carrier. American Airlines flight # AA 125 (AAL125) started service in June 2014 and now claims the title of 12th longest non-stop flight in the world. The 8,123 mile (13,073 km) route has a scheduled westbound flying time of 16 hr 55 mins aboard a Boeing 777-300ER. Cabins offered: First (9.4), Business (9.7), Premium Economy (8.9) & Economy (8.2). 13- Dubai-DXB <–> San Francisco-SFO comes in at #13 at a distance of 8,103 miles (13,041 km) on Emirates’ Airbus A380-800. The scheduled flying time for flight # EK 225 (UAE225) is 16 hr 00 min. JFK–>HKG on Cathay Pacific. They fly this route appx 3x times per day on Boeing 777-300ERs, covering 8,072 miles in around 15 hr 55 mins to 16 hr 10 mins. 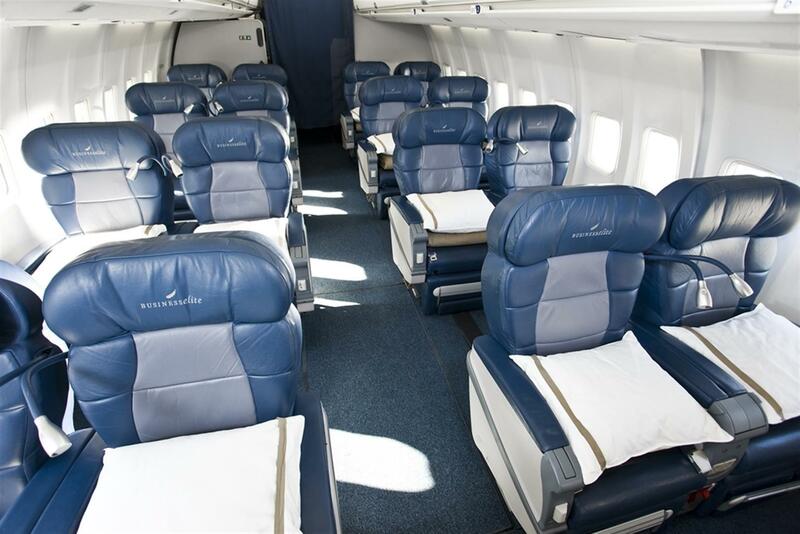 Cabins offered: First (9.5), Business (9.5), Premium Economy (8.8) & Economy (8.4). EWR–>HKG on Cathay Pacific. This 8,065 mile route is offered 1x per day on Boeing 777-300ER. Flying time is scheduled at 15 hr 50 mins. Flight # is CX 899 / CPA899. Cabins offered: Business (9.5), Premium Economy (8.8) & Economy (8.4). EWR–>HKG on United Airlines’s Boeing 777-200. The scheduled flying time for flight # UA 179 / UAL179 is 16 hr 00 mins. Cabins offered: Business (9.3), Premium Economy (8.9) & Economy (8.4). Between these 5x daily flights there are appx 1,369 seats a day on the NYC-HKG route, pretty crazy! 16- Abu Dhabi-AUH <–> Dallas-DFW currently registers on the list at #16 and was started on December 3, 2014. When it was started, Dallas became the 5th US city served by Etihad direct from Abu Dhabi. The 16 hrs 35 min flight covers 8,071 miles (12,989 km). If you’re interested in flying EY 161 / ETD161, you’ll end up on an Etihad Boeing 777-200LR/F. 17- Doha-DOH <–> Houston-IAH is operated by Qatar Airways’ Boeing 777-200LR/F. At 8,047 miles (12,951 km), the 16 hrs 40 mins flight has been in service since 2009. Track flight # QR 713 / QTR713 here. 18- Dubai-DXB <–> Dallas-DFW gives Emirates its 4th route in the top 20 longest non-stop flights. The 8,040 mile (12,939 km) trip takes 16 hr 15 min. Flight # EK 221 / UAE221 (click to track) is operated by a Boeing 777-300ER. 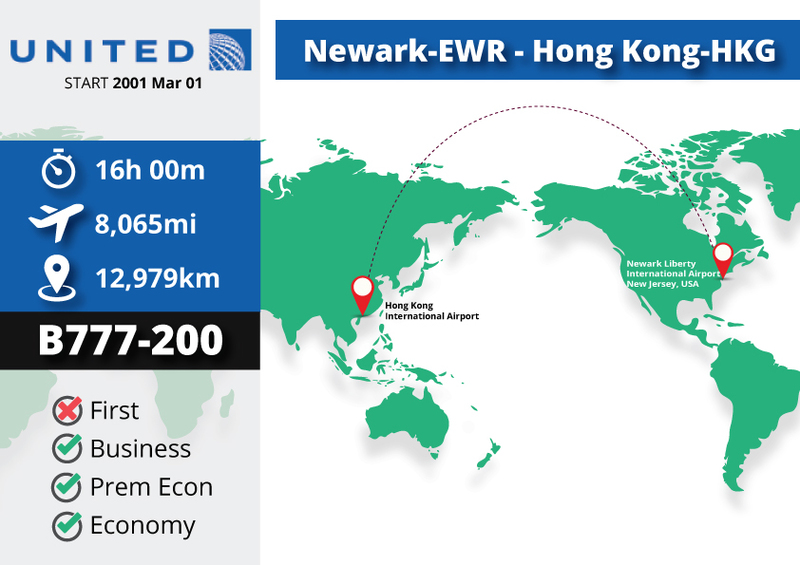 19- Guangzhou-CAN <–> New York-JFK started operations in August 2014. The 2x daily flights cover an 8,002 mile (12,878 km) distance that takes a scheduled time of 15 hr 40 mins on China Southern Boeing 777-300ERs. The late night flight is CZ 399 / CSN399 and the early evening flight is CZ 300 / CSN300. Cabins offered: First (9.2), Business (9.5), Premium Economy (8.8) & Economy (8.4). 20-Hong Kong-HKG<–> Boston-BOS gives the Hong Kong based Cathay Pacific its 3rd flight in the top 20. This route is scheduled to take 15 hr 45 min abroad a Boeing B777-300ER. You can track the 7,970 mile (12,826 km) flight here: CX 812 / CPA812. 21- Johannesburg-JNB <–> New York-JFK now comes in at #21 on the list thanks to new routes bumping it down (it was once # 10!). The 7,969 mile (12,825 km) flight takes 16 hr 10 min on a South African Airbus A340-600. Track the flight here: SA 204 / SAA204. 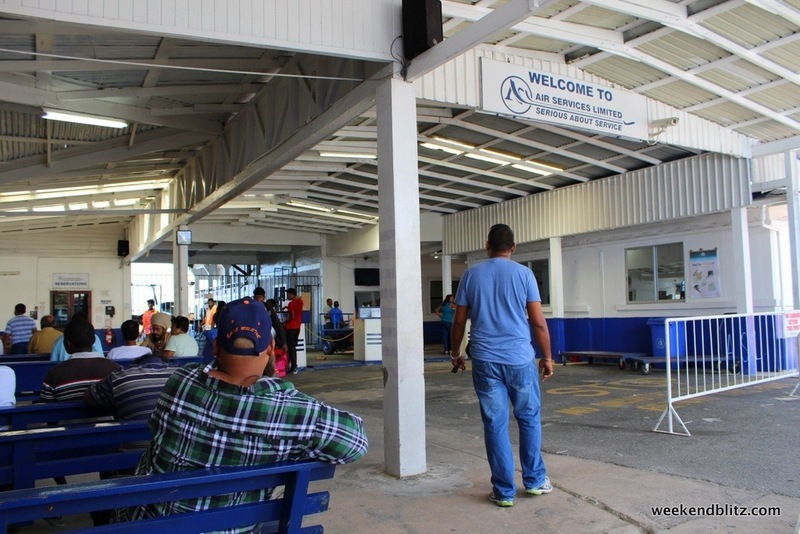 Cabins offered: Business (9.1) & Economy (8.1). –> Newark-EWR <–> Singapore-SIN held the title as world’s longest flight for nearly 10 years (service ended on Nov 23, 2013). The all-business class Airbus A340-500 flew the planned distance of 9,534 miles (15,343 km) in 18 hr 50 min. 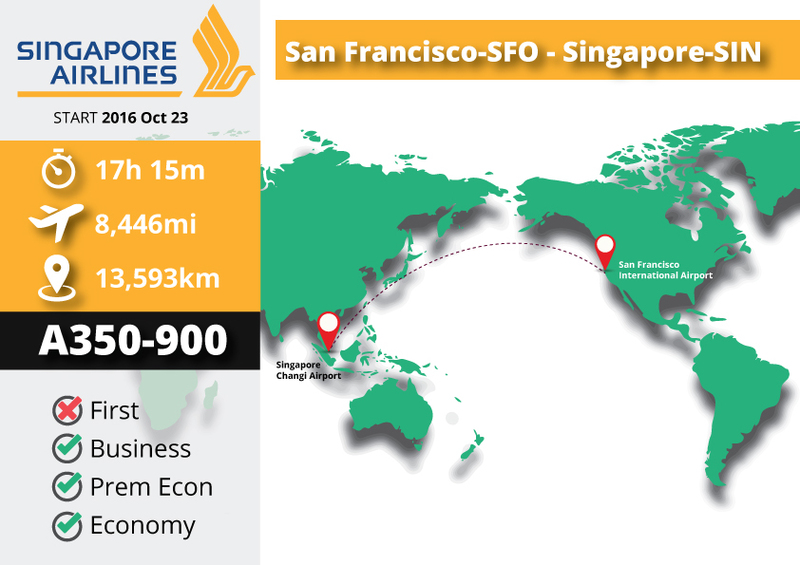 Singapore has just resumed non-stop service from the US to Singapore with the addition of a flight from San Francisco to Singapore. –> Los Angeles-LAX <–> Singapore-SIN had a similar start and end date as Newark-Singapore. The all Business Class A340-500 flew appx 18 hr 05 min and covered a distance of 8,770 miles (14,114 km). 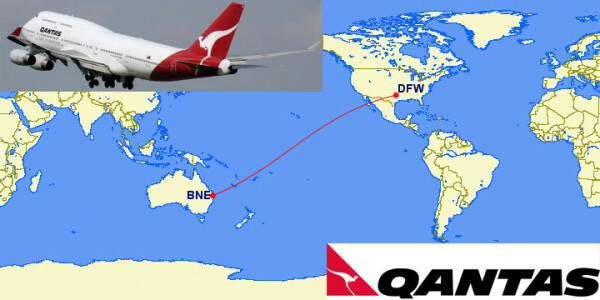 –> Dallas-DFW <–> Brisbane-BNE was another Qantas route served by their Boeing 747-400ER. At 8,303 miles (13,363 km) they’d get you there in appx 16 hrs. When Qantas switched the aircraft on this route from the B747 to an A380, the stop at BNE was no longer necessary and, as a result, this route stopped service on September 28, 2014. Future record holder? 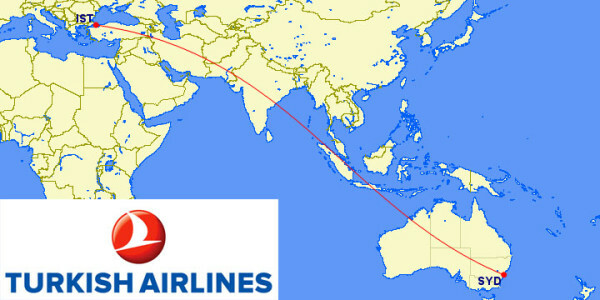 Turkish Airlines has announced plans for a route from Istanbul-IST to Sydney-SYD, 9,293 miles apart. This route would beat current record holder, Auckland-Doha, by over 250 miles. More details on the announcement here: Turkish Airlines to start world’s longest non-stop flight, to Australia. The airline says they’ll likely use a Boeing 777-300ER on the route.